On November 14th 2015, Larry H Miller Chrysler Jeep Tucson, and Larry H. Miller Dodge Ram Tucson held the Grid Iron Giveaway. The opportunity will be driving away in a brand new 2015 Jeep Patriot from the Larry H. Miller Dealerships! The giveaway was open to the public, where entries were collected at University of Arizona home games and online. 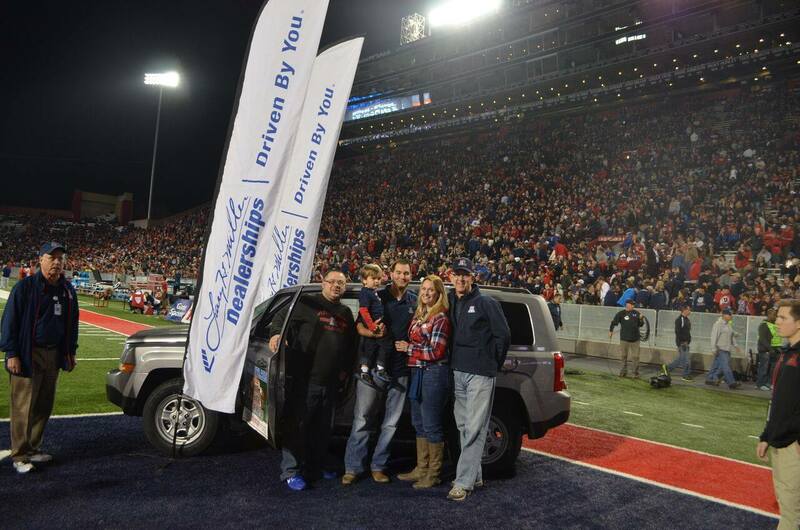 Each finalist will received two free tickets to the November 14, 2015 University of Arizona vs Utah football home game where they had the opportunity to win a 2-Year Lease on the Prize Vehicle! Daniel Rodriguez, Aubree Sieker, Ida Lopez and Alicia Chacon were selected to take their chance to turn the key! Daniel Rodriguez, was our winner of a brand new Jeep Patriot courtesy of Larry H. Miller Chrysler Jeep Tucson and Larry H. Miller Dodge Ram Tucson! Thank you again to everyone who participated our Grid Iron Giveaway! Larry H. Miller Chrysler Jeep Tucson offers a wide selection of pristine vehicles and services to the greater Tucson area. Stop by our dealership for the best car-buying experience in town.